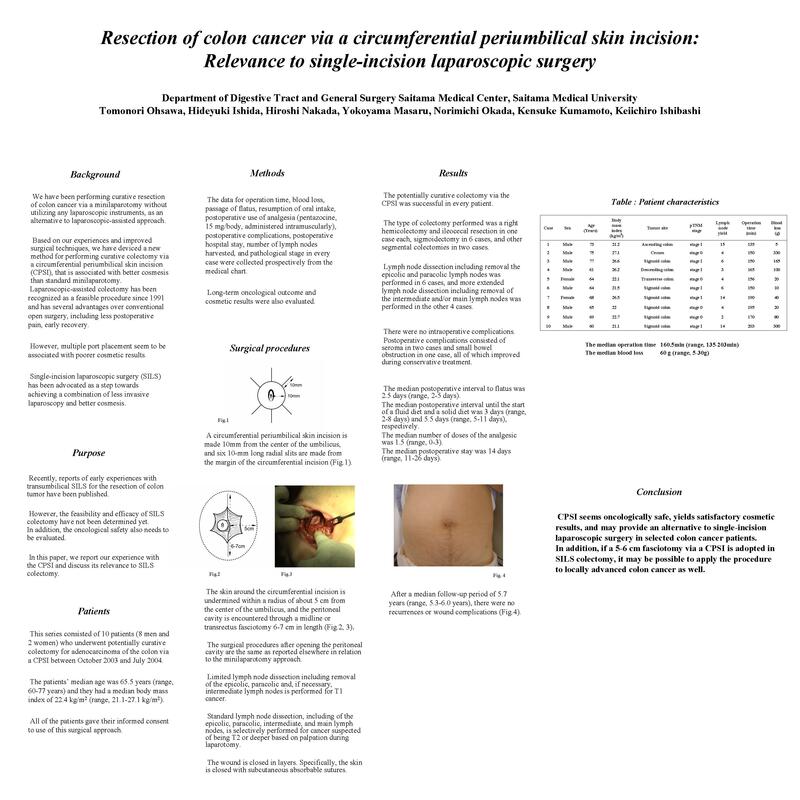 Background and Purpose: Single incision laparoscopic surgery (SILS) has been introduced to colonic cancer. One of the benefits of SILS is better cosmesis compared with other surgical approaches. We have previously performed resection of T1N0 or Tis colon cancer via circumferential periumbilical incision (CPI), which seems to be an alternative to SILS. The long-term oncological and cosmetic results of CPI were evaluated. Patients: The subjects were 11 cases of colon cancer whose tumor was resected via CPI between 2003.10 and 2004.7. Patient ages ranged from 61 to 77(median, 66.5)years . The male:female ratio was 8 to 2. Body mass index was 21.1 -27.7 (median, 22.4) kg/m2. The site of primary lesion was the cecum in one, ascending colon in one, transverse colon in one, descending colon in one, and sigmoid colon in 6. Preoperative T-factor was Tis in 5 and T1 in 5. Segmental colectomy with limited (n=9) or standard lymph node dissection (n=1) was performed via CPI without utilizing any laparoscopic instruments. Results: CPI was successful in all patients. The duration of surgery ranged from 135-203 (median, 160.5) min. The bloos loss ranged from 5-300 (median, 60) mL. Postoperative complications included fat lysis in two and small bowel obstruction in one. Pathological stage was stage O in 4 and stage I in 6. With a median follow-up period of 60 months, there was no recurrence or wound complication. Conclusion: CPI seems oncologically safe and has satisfactory cosmetic results in selected patients with Tis and T1N0 colon cancer. CPI is considered an alternative to SILS and its indication seems to be expanded when performed with laparoscopic assistance.